Rain lashes down out of an ominous black sky as eminent broadcaster Sara Cox ushers me into the terraced house she shares with her family in Manchester. “It’s like the end of the world!” she gawps. “Actually Sara when the Earth is finally swallowed by the sun there’ll be a lot more heat and a lot less liquid water,” chirrups her brother Brian, emerging to take my coat. Brian’s band D:Ream are on the verge of staging a comeback after many long years in the pop wilderness. Brian’s tried to make a living for himself in the meantime by giving science lessons to remedial children locally, but he’s the first to admit it hasn’t been easy. “They just don’t care about the wonder of physics!” he tells me, fixing me with an enchanting stare. Just then Brian’s wife Courteney wafts fragrantly in, shrugging off a cashmere coat to reveal a tight low-cut dress and four inch heels. “I’ve been working in the orchard,” she explains, referring to the family’s famous apple empire. Her accent sounds American, I remark. “Brian and I met at a Bruce Springsteen concert in the 80s,” she says affectionately. 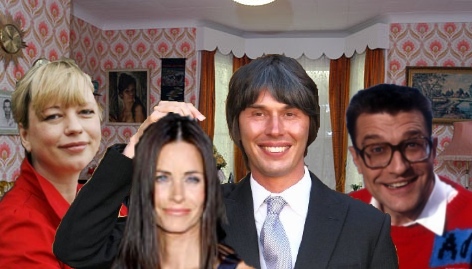 This entry was posted in Celebrity families and tagged courteney cox, doc cox, professor brian cox, sara cox. Bookmark the permalink. I, er, am not familiar with his work! I both love and am slightly scared of everything you write. But yes.